In this episode Shahriar demonstrates the capabilities and features of the Carbide 3D Nomad 883 Pro CNC machine. The primary interest is for PCB milling and therefore the machine’s accuracy, speed and software capabilities are examined. The Nomad 883 Pro offers an Aluminum chassis design with a custom machined spindle. XYZ movements are supported by linear bearings with a resolutions of 0.0005 inches and a reputability of 0.0015 inches. Furthermore the Nomad has an accuracy of 0.005 inches. Unfortunately the spindle speed is limited to 10,000 RPM which lags behind other competing CNC machines such as the Bantam Tools Pro (formally Othermill Pro) which support up to 26,000 RPM. In order to push the machine to its limits, a benchmark PCB design is milled with features smaller than 10 mils. The result shows that the PCB flatness is critical for achieving such fine features since the Nomad does not currently offer mapping features. All milling is done in a custom-made oil bath which must be used for FR-4 materials due to dangerous glass-dust generation during milling. Spindle speed is important – I run at 20,000 rpm. I solved my board flatness issue by putting a slight curve in the board and clamp it down on opposite sides. Care to share the files for the pcb carrier you made? 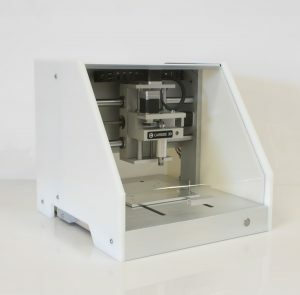 Seems like an excellent solution for milling fr4.